The abrasive water jet (AWJ) cutting method has been used widely for the cutting and processing of materials because of its cool, damage-free, and precise cutting technique. Nowadays, the use of AWJ cutting in the natural stone industry is increasing. However, the effectiveness of AWJ cutting of natural stones is dependent on the rock properties and machine operating parameters. In this study, injection-type AWJ cutting was applied to 42 different types of natural stones to investigate the effects of rock properties and operating parameters on the cutting depth. Shore hardness, Bohme surface abrasion resistance and the density of the rocks were the most significant rock properties affecting the cutting depth. The working pump pressure and traverse velocity were the most significant operating parameters affecting cutting, as has been shown previously. The relationships between the rock properties or operating parameters and the cutting depth were evaluated using multiple linear and nonlinear regression analyses, and estimation models were developed. Some of the models included only rock properties under fixed operating conditions, and others included both rock properties and operating parameters to predict cutting depth. The models allow for the preselection of particular operating parameters for the cutting of specific rocks types. The prediction of cutting depth is a valuable tool for the controlled surface machining of rock materials. The history of water jets extends back to the discovery of the erosional effect of water streams in nature. Water power has been used in cutting and removal applications for many years. As mentioned by Summers1, the first attempts to use water jets for cutting were carried out in California, USA, in 1852 to abrade gold-bearing rock. The method was adapted first for the mining of steeply dipping coal seams and later for hydraulic coal mining, in which it has been applied around the world. By increasing the pressure, the water becomes powerful enough to use for cutting rocks. In 1970, the water jet method began to be used in industry to machine materials in non-traditional machining operations. High-pressure water jets are classified into two main types: pure water jets and abrasive water jets (AWJ). The basic difference between these two types is the addition of an abrasive medium in AWJ to increase the cutting ability of the water jet. Water jet cutting studies were focused first on coal cutting in the mining industry, and then researchers started to investigate the use of continuous and discontinuous water jets in the cutting of rocks. Some of these studies investigated the parameters affecting the rock-cutting process. Brook and Summers2 studied rock penetration by water jets; Nikonov and Goldin3 studied rock and coal penetration by continuous water jets; and Chermensky4 focused on rock breakage rather than rock cutting by pulsed water jets, which was an improved use of water jets. Hagan5 investigated the cuttability of rocks using high-pressure water jets and reported that water pressure had the greatest impact on the level of surface damage to the rock, although traverse speed was found to also alter the magnitude of the surface damage. The addition of an abrasive agent made the water jets more powerful. The use of abrasive-containing water jets for the drilling, cutting and excavating of rocks has been investigated by a number of researchers. Laund et al.6 investigated the relationships between the linear traverse speed and the depth of cuts and quality of cut surfaces in rock cutting by AWJ. Xiaohong et al.7 performed experimental studies on rock cutting using collimated AWJ. Various cutting models using water jet and AWJ cutting mechanisms have been developed.8,9,10,11,12,13,14,15,16 Zeng and Kim11 developed a model for the cutting of brittle materials. Babu et al.15 studied water jet cutting of black granite and suggested a fuzzy-based approach for process parameter selection. Brandt et al.16 made a technical and economical evaluation of water jet cutting applications. To increase the power and cutting efficiency of water jets, Siores et al.17, Chen et al.18 and Lemma et al.19 studied different cutting techniques such as nozzle oscillation. Hashish et al.20 and Susuzlu et al.21 studied the effects of increasing the pressure of water jets to ultra-high levels, while others22,23,24,25,26,27 investigated improving the quality of the cut surfaces. There have been other studies in addition to those mentioned above that have investigated water jet and AWJ cutting and processing applications. More recently, water jets and AWJ have been used in rock-cutting applications for slotting or precision cutting purposes. Ferris and Hall28 investigated water jet cutting and diamond wire sawing practices in dimensional stone quarries. They reported that water jet cutting can simplify and improve overall operating efficiency and predictability. While water jet slotting is applied in natural stone quarries to cut and remove in-situ blocks, AWJ cutting is used for the shaping of decorative natural stone tile parts. AWJ cutting is the only cutting method which is able to cut any shape or free form, as well as sharply angled contours and oblique angles. This study investigated the effect of the rock properties and operating parameters on the cutting depth of injection-type AWJ. The AWJ cutting depth of rocks was also estimated using multiple linear and nonlinear regression analyses. AWJ cutting was applied to 42 different rock types. The geomechanical properties of the rock samples studied were: density, water absorption, hardness, abrasion resistance, uniaxial compressive strength and tensile strength. The cutting parameters tested were: the nozzle traverse speed, pump pressure and abrasive flow rate. Although many studies have been conducted on AWJ cutting, the target materials used were mostly metals, ceramics and glass. Stone type materials have very different characteristics and resistance to cutting by AWJ. The density, porosity, elasticity, and strength of rocks differ from those of metals, ceramics and glass. Use of the AWJ cutting system in the natural stone industry is increasing globally.29 Some AWJ cutting machines were initially purchased for metal cutting, but later became used for cutting decorative stone products because of the excessive demand for these products in Turkey. The results of this study will contribute to the effectiveness of the cutting of natural stones using injection-type AWJ. Different types of Turkish natural stones were cut by injection-type AWJ under different operating conditions to investigate the effects of the rock material and the operating parameters on cutting depth. A high traverse rate of the nozzle was selected for all cutting applications, so that the jet could reach only to a definite depth of the rock samples and not penetrate the length of the rock. The depth value indicates the resistance of the rock material to cutting. Rocks with different mineralogical, physical and mechanical characteristics were chosen expressly to observe the effects of these properties on cutting depth. The effects of the operating parameters on cutting depth were investigated by cutting the rock samples using different pump pressures, nozzle traverse velocities and abrasive flow rates. 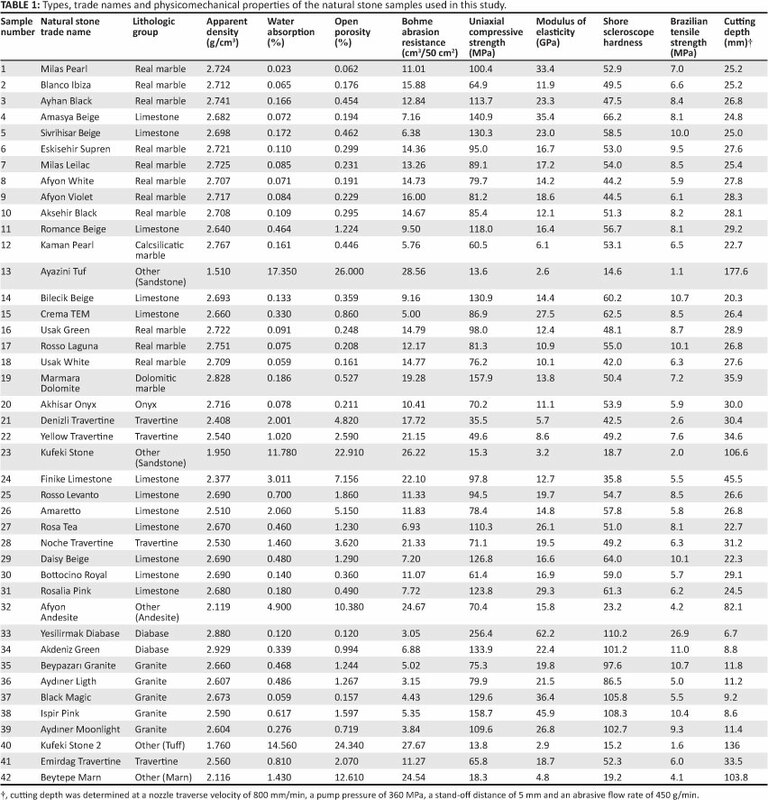 The relationships among the structural properties of the rock samples, the operating parameters, and the AWJ cutting depth were analysed statistically. Rock samples were collected from natural stone quarries or, in limited situations, from natural stone processing plants. Table 1 provides the sample number, trade name, lithologic description and petrographic rock type of all 42 samples. Rock specimens were cut and treated prior to the laboratory tests and AWJ cutting. Test specimens were prepared from rock samples that were free of fractures and alteration zones. Laboratory test specimens were prepared according to the methods suggested by the International Society for Rock Mechanics, prepared by Ulusay and Hudson30 as a book. Cut samples were shaped as rectangular prisms with 50-mm, 100-mm, and, if necessary, 200-mm and 300-mm thicknesses. 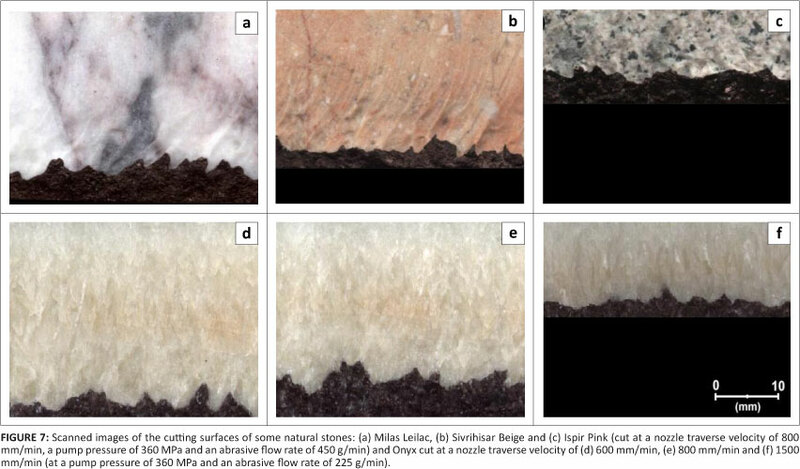 In preliminary AWJ cutting attempts in this study, using the planned operating conditions, it was observed that water jets could pass through the specimen of some weaker natural stone samples and split it. Therefore samples of 200-mm and 300-mm thicknesses were prepared for these natural stones (e.g. Kufeki Stone) in order to measure the cutting depth under the same operating conditions. Laboratory tests were used to determine the mineralogical, physical and mechanical properties of the samples. Apparent densities, water absorption at atmospheric pressure, and open porosity properties of the rock samples were determined. The Shore scleroscope (C type) hardness test was used to determine the rebound hardness of the rock specimens. The abrasion resistance of the samples was determined according to the Bohme surface abrasion test. The modulus of elasticity of the samples was calculated using strain measurements taken by a linear variable differential transformer sensor. Stress measurements were performed with the uniaxial compressive strength test. The tensile strength of each sample (cylindrically shaped with a diameter of 41 mm and a standard thickness) was determined by the Brazilian tensile strength test. Tests were performed in accordance with the methods of testing recommended by the International Society for Rock Mechanics. The results of these tests are given in Table 1. As mentioned by Kiilekgi31, an AWJ cutting system consists of five main parts, (1) a high-pressure pump (usually the intensifier type) that provides high-pressure water, (2) a cutting head that produces the abrasive water jet, (3) an abrasive delivery system that carries abrasive grits to the cutting head, (4) a computer-controlled unit that controls the motion of the cutting head and (5) a catcher that absorbs the remaining jet energy after cutting. The AWJ cutting operation is shown schematically in Figure 1. In this study, AWJ cutting was applied by the injection-type high-pressure AWJ cutting machine. All of the samples were cut by the same AWJ cutting machine, which had an orifice of 0.35 mm, a focusing tube of diameter 1.1 mm and length 80 mm, a working pressure of 90 MPa - 360 MPa, an intensifier-type high-pressure pump (37 kW) and abrasive properties of an 80 mesh Indian garnet. The same abrasive product was used in all cuttings. Azmir and Ahsan32 stated that 90% of all AWJ machining is performed using garnet because of the unrivalled advantages of this mineral. In this study, a commercial garnet mineral called almandine was used as the abrasive medium. Measuring the cutting depth within the kerf, or groove in the sample, after cutting was not possible because the kerf was too narrow (1 mm - 1.5 mm). To measure the AWJ cutting depth of the rock samples, the test samples were first split through the cutting kerf, and then the cutting surfaces were imaged by a scanner. The cut-surface images were transferred to a computer. The depth attained by the jet was observed as a curve in the cutting direction, and the mean cutting depth for a sample was calculated by scaling the background using an image processing program called Paint Shop Pro33 (Figure 2). At least three test samples were prepared, cut, and measured in this way for each rock type. The reported values of the AWJ cutting depths are the overall mean cutting-depth values for each type of rock. Cutting depth is also a good measure of the resistance of a natural stone to AWJ cutting, although it is not the same as the specific cutting energy related to the removed debris while cutting. The cuttability of rocks using AWJ is also affected by machine operating parameters such as the operating water pressure, nozzle traverse speed, abrasive flow rate and stand-off distance. AWJ cutting applications were performed under different operating conditions, and the effects of these operating parameters on the cuttability of rock were investigated. 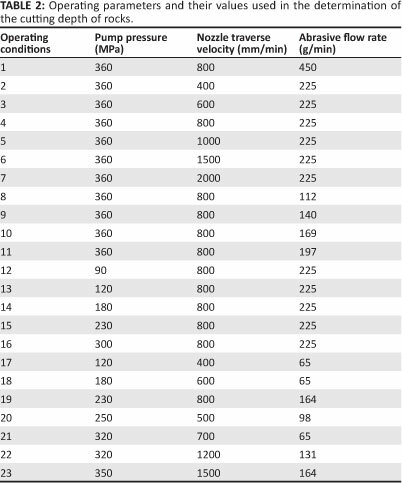 Operating parameters such as pump pressure (Pp), traverse velocity (Vn), abrasive flow rate (Ma), water flow rate (Mw), stand-off distance (x) and cutting depth (h) are illustrated in Figure 1. Values of selected cutting parameters are given in Table 2. The pump pressure, abrasive flow rate and nozzle traverse velocity values were arranged so as to be able to hold the jet at a particular depth in the natural stone samples. In cutting applications, two parameters were held constant and the other was changed to investigate the effects of the individual parameters on the cutting depth. The depth of the cut in a rock is affected by the properties of the rock and by the operating parameters. To investigate the relationships between the rock properties and cutting depth, all operating parameters were held constant. The nozzle traverse velocity was 800 mm/min, the pump pressure was 360 MPa, the stand-off distance was 5 mm and the abrasive flow rate was 450 g/min. The cutting depths of 42 different rock types were compared. The relationships between the operating parameters and cutting depth were investigated by cutting nine rock types under different operating conditions (Table 2). These nine rocks (Amasya Beige, Sivrihisar Beige, Afyon White, Usak Green, Usak White, Akhisar Onyx, Finike Limestone, Beypazari Granite and Amaretto) represent the main rock groups that were investigated. The operating parameters tested were: the pump pressure, nozzle traverse velocity, stand-off distance and abrasive flow rate. The relationships between the cutting depth and some physical and mechanical properties of the rocks are given in Figure 3. At first attempts, all operating parameters were held constant, and all the natural stone samples were subject to AWJ cutting (grooving) applications. Then, the relationships between some rock properties (such as density, porosity, Shore scleroscope hardness, Bohme surface abrasion loss, uniaxial compressive strength, modulus of elasticity and tensile strength) and cutting depth were investigated. Although all rock properties affect the AWJ cutting of rocks, some properties were observed to have a greater influence and were controlling factors in cutting applications. The hardness, density, porosity and abrasion resistance of natural stones had the strongest relationships with cutting depth. The cutting depth increased exponentially with an increase in the Bohme surface abrasion loss value, and decreased exponentially with an increase in the hardness of the samples. Uniaxial compressive strength, modulus of elasticity, and tensile strength of the rock also correlated with the cutting depth, but these correlations were respectively low (0.60 < R2 < 0.65; data not shown). AWJ cutting is based mainly on the erosion effect of abrasive particles in the jet during cutting. In this situation, microstructure of the natural stone samples is considered as more important, and hardness, density and abrasion resistance properties of the samples are supposed to give important information about the microstructure of the samples. 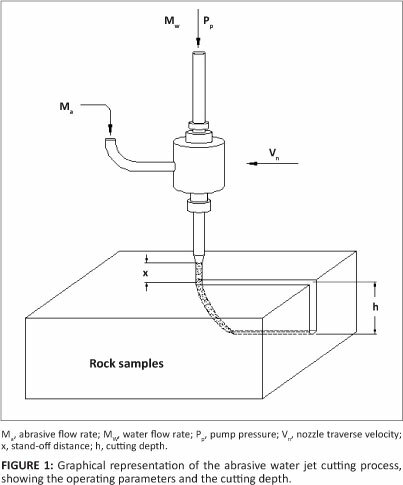 The relationships between the cutting depth and traverse velocity of the nozzle, pump pressure and abrasive flow rate are given for some rocks in Figure 4. Cutting depth decreased with an increase in the traverse velocity of the nozzle. The rate of decrease in the cutting depth differed between rocks. Sample 35 is Beypazari Granite, which is one of the strongest rocks investigated in the study, and Sample 24 is Finike Limestone, one of the weakest rocks used in this study. The inverse relationship between traverse velocity and cutting depth is more dramatic for the Finike Limestone than for Beypazari Granite. Rock strength can be interpreted by different rock characteristics or their combinations, such as density, hardness, abrasion resistance and compressive strength, according to the specified usage area. For example, when a natural stone tile is intended to be used on the floor of a crowded place, it has to show high hardness and abrasion resistance. In such situations, the tile does not need to have high uniaxial compressive strength, but strength in terms of hardness and abrasion resistance. For example, Finike Limestone has a high compressive strength but wears easily when laid on a floor. As a floor covering, Finike Limestone can be classified as a weak rock. In AWJ cutting applications, hardness, abrasion resistance and density together constitute the strength of a material because this cutting method is a micromachining and erosion-based material removing process. When an adequate traverse velocity is selected for a given material, there will not be any excessive loading on the cut material by the AWJ. This situation can be experienced dramatically when the abrasive grit feeding is turned off during the cutting application - the cut material is broken in a few seconds because the erosive potential of the water drops is not enough to cut the material, and the velocity of the jets turns to velocity pressure (according to the Bernoulli equation), which exceeds the uniaxial compressive strength of the cut material. When the rock strength is low, the cutting depth decreases by a greater power than that of an increase in the nozzle's traverse velocity. The same relationship exists between the cutting depth and the pump pressure and, to a lesser extent, between the cutting depth and the abrasive flow rate. Weak rocks are more sensitive to changes in operating parameters than are strong rocks (see for example Figure 3). 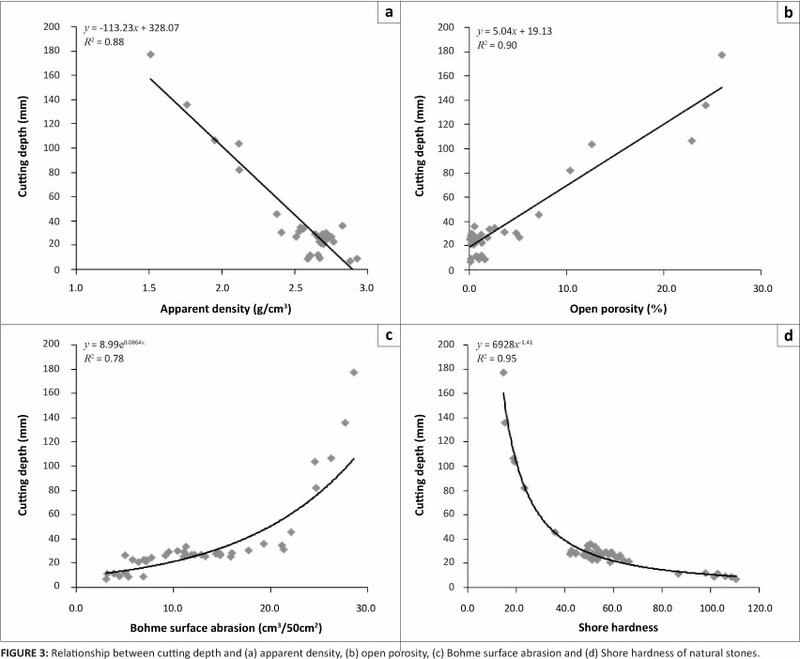 In Figure 3, Sample 24 (Finike Limestone) has a density of 2.377 g/cm3, an abrasion loss of 22.1 cm3/50 cm2 and a Shore hardness of 35.8; whereas Sample 35 (Beypazari Granite) has a density of 2.660 g/cm3, an abrasion loss of 5.02 cm3/50 cm2 and a Shore hardness of 97.6. The slope of the linear regression trend line of pump pressure versus cutting depth for Finike Limestone is 0.11 whereas the slope for Beypazari Granite is 0.03. The slope values for the other natural stones lie within these values according to their density, hardness and abrasion resistance combinations. Weak natural stones with a low density, low hardness and high abrasion loss will have high linear regression trend line slopes and vice versa for strong natural stones. Similar relationships are seen for all the natural stones for the other operating conditions. It was observed in the study of the relationships between cutting depth and rock properties or operating parameters that some parameters affect the cutting depth more than others do. Pump pressure, traverse velocity, abrasive flow rate, Shore scleroscope hardness, apparent density and Bohme abrasion resistance are the most influential parameters determining the cutting depths. Nozzle stand-off distance also affects cutting depth. A 5-mm stand-off distance was determined to be the optimum value. 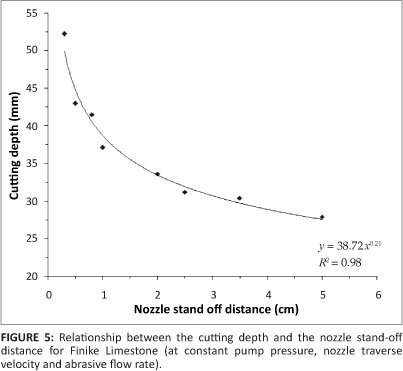 A stand-off distance shorter than 5 mm increases the cutting depth but may also cause damage to the nozzle and the rock sample because of back pressure or obstruction. The effect of the stand-off distance of the nozzle on the cutting depth is shown for Finike Limestone in Figure 5. Cutting depth increased exponentially with a decrease in stand-off distance. Although the surfaces of the natural stone samples were flat and smooth, the risk of back pressure or obstruction limits the stand-off distance to at least 5 mm. In the first model [Eqn 1], the operating parameters were held constant for all 42 samples (as given in Table 1) and only the effects of the rock properties were investigated in detail. In the second model [Eqn 2], the same rock properties were analysed by the nonlinear regression method. where h is the cutting depth (mm), Da is the apparent density (g/cm3), H is the Shore scleroscope hardness, Ra is the Bohme abrasion resistance (cm3/50 cm2), UCS is the uniaxial compressive strength (MPa), Em is the modulus of elasticity (GPa) and ST is the Brazilian tensile strength (MPa). In the third model [Eqn 3], the effects on cutting depth of Shore scleroscope hardness, Bohme abrasion resistance and apparent density were investigated. These rock properties were chosen based on the experimental results (Figure 3). In the fourth model [Eqn 4], the same rock properties were analysed by the nonlinear regression method. In the third and fourth models, the operating parameters were held constant. In the fifth model [Eqn 5], the pump pressure (Pp; MPa), nozzle traverse velocity (Vn; mm/s) and abrasive flow rate (Ma; g/min) were used as operating parameters, and the Shore scleroscope hardness, apparent density and Bohme abrasion resistance were used as rock properties. In the sixth model [Eqn 6], the pump pressure, nozzle traverse velocity, and abrasive flow rate were used as operating parameters, and the Shore scleroscope hardness was the only rock property used. Calculation of the AWJ cutting depth is simpler in this model because of the use of only one rock property. The fifth and sixth models take into consideration the cutting depths of different rocks at constant operating parameters (listed in Table 1) and for the nine selected natural stones under different operating conditions (listed in Table 2). 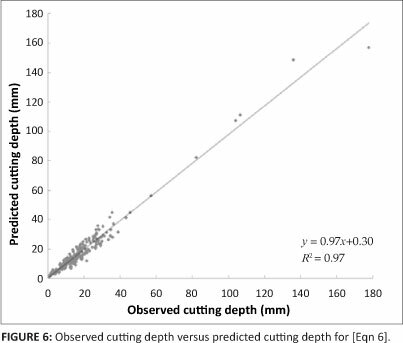 The models were validated by determining the regression coefficient, plotting the observed cutting depth versus the estimated cutting depth (Figure 6), and the F-test. In Figure 4, the points are scattered uniformly about the diagonal line, suggesting that the models are good. Pump pressure, nozzle traverse velocity and rock hardness show nonlinear relationships with cutting depth. The relationship between rock hardness and cutting depth can be defined by a power function. Cutting depth decreased exponentially with an increase in Shore hardness, as can be seen in Figure 3. The same inverse relationships exist for nozzle traverse velocity versus cutting depth and pressure versus cutting depth. Therefore, the determination coefficients of the nonlinear models are higher than those of the linear models. Both the statistical models and the experimental results show that the microstructure of the rocks is more important than the macrostructure, in terms of AWJ cutting. The correlation coefficients (R2) of the models are higher than 0.91. These values are acceptable but do not necessarily verify that the models are valid. To test the significance of the regressions, analysis of variance was employed. In this test a 95% level of confidence was selected. If the computed F-value is greater than the tabulated F-value, the null hypothesis is rejected. The null hypothesis holds that there is a real relationship between the dependent and independent variables. Because the computed F-values are greater than the tabulated F-values for the models, the null hypothesis is rejected. Therefore the models are valid. 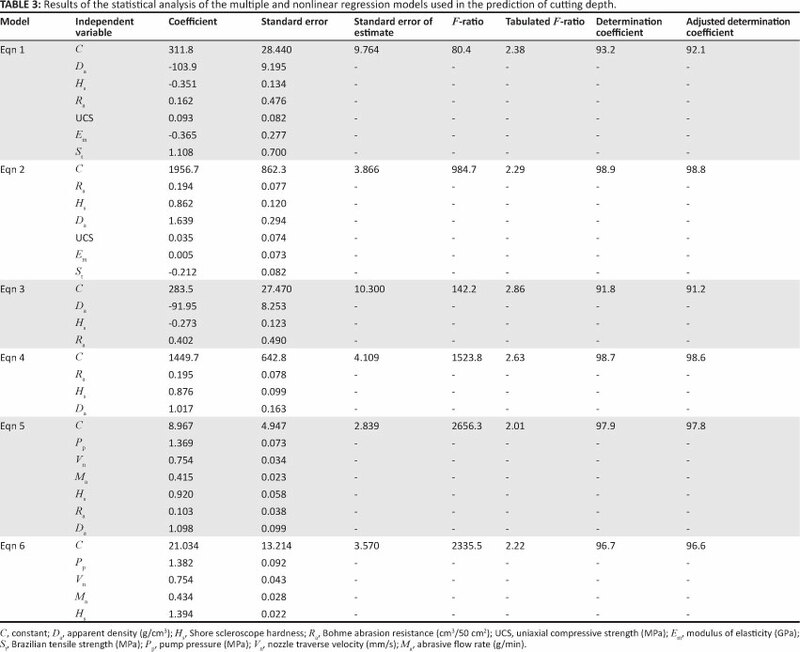 The statistical results of the models are given in Table 3. Rock cutting using AWJ is affected by the rock properties and operating parameters. This study used both experimental results and several regression models to understand the importance of these factors. The validity of the models was established using statistical tests. The models can therefore be used to predict AWJ cutting depth and to select operating parameters for a given rock type and thickness. Natural stone samples used in this study included real marble, limestone, calcsilicatic marble, sandstone, dolomitic marble, onyx, travertine, andesite, diabase, granite, tuff and marn, all of which have different physical and mechanical properties. Within each lithologic group, some of the properties may be similar amongst rock types, whilst others may differ. For example, densities of the real marble samples such as Afyon White, Milas Pearl, Aksehir Black and Usak Green are similar to each other, but hardness, abrasion resistance, compressive strength and other physical and mechanical properties differ among samples. For this reason, more than one natural stone type was selected from each lithologic group. In the first part of the study, the operating parameters were held constant to investigate the effects of the rock properties on cutting depth. Density, porosity, Shore scleroscope hardness, Bohme surface abrasion loss, uniaxial compressive strength, modulus of elasticity and tensile strength of the natural stone samples were determined and correlated with cutting depth. Correlations between cutting depth and some rock properties, such as uniaxial compressive strength, modulus of elasticity and tensile strength, were low (0.60 < R2 < 0.65; data not shown). Results of the mechanical strength tests investigating the structure of the relatively large samples indicated that mechanical strength had only a small effect on AWJ cutting because the AWJ cutting process is a micromachining process. The highest AWJ cutting depth values were observed in the cutting of 'other' groups of natural stones, especially the tuffs, and then the travertines, real marbles, limestones, calcsilicatic marble and granites; the diabases exhibited the lowest cutting depths. Although the real marbles have a higher density than the limestones, the cutting depths of the real marbles were lower than those of the limestones. This result is because limestones have a higher hardness and abrasion resistance than real marbles. The main structure of the real marbles is formed by recrystallised calcite minerals, but the limestones used in this study were formed by calcareous fossil remains, which is why the hardness and abrasion resistance of the limestones are higher than that of the real marbles. Diabase natural stone samples (Yesilirmak Diabase and Akdeniz Green) had the highest density and hardness and very high abrasion resistance; therefore the lowest cutting depths were observed for diabases because of their high resistance to cutting. In the second part of the study, Amasya Beige, Sivrihisar Beige, Afyon White, Usak Green, Usak White, Akhisar Onyx, Finike Limestone, Beypazari Granite and Amaretto natural stones were selected to investigate the effect of the operating parameters on cutting depth. 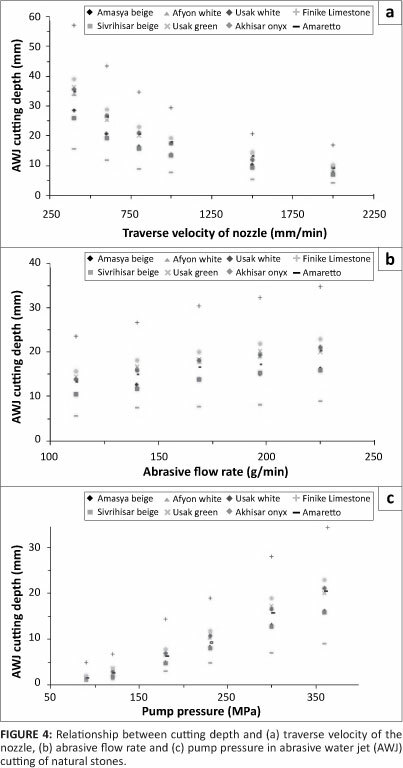 AWJ cutting depth decreased exponentially with an increase in nozzle traverse velocity, increased exponentially with an increase in pump pressure and increased logarithmically with an increase in abrasive flow rate. These relationships were evident for all the natural stone types, but the cutting depth at any operating condition was different for the different natural stone types. AWJ cutting depth can be increased by increasing pump pressure and abrasive flow rate and decreasing traverse velocity. However, increases in the pump pressure and abrasive flow rate are limited, because of the capacity of the pumps and the risk of obstruction at excessive abrasive flow rates. When pump pressure and abrasive flow rate are insufficient, controlling the traverse velocity can control the cutting depth, if a high cutting depth is required. The most significant parameters affecting the cuttability of natural stones are the Shore scleroscope hardness, apparent density, Bohme abrasion resistance, pump pressure, nozzle traverse velocity and abrasive flow rate. In the constitution of the models, weighting of the parameters in the estimation of cutting depth was determined by the iteration via the Statgraphics software. In the first four models, constant operating parameters were selected, and the effects of the rock properties on the AWJ cutting depth were investigated for 42 different types of natural stones. [Eqn 5] represents all significant rock properties and operating parameters and gives the best results. [Eqn 6] simplifies the prediction of the cutting depth and the effects of the operating parameters in practice but includes only one rock property - the Shore hardness value - although the other required parameters can be easily calculated. In this study, the Shore hardness, Bohme surface abrasion resistance and density of the rocks were the most significant rock properties affecting the cutting depth. When the abrasive material hits the surface of the target material, the mass of the chip removed from the surface is related to the momentum of the abrasive grits. According to the conservation of momentum principle, a fragment is more difficult to remove, using AWJ, from a rock surface with a higher density. The working pressure controls the velocity of the water jet leaving the orifice and also directly affects the velocity and momentum of the abrasive grits within the jet. The traverse velocity of the nozzle and the abrasive flow rate determine the number of abrasive particles hitting the rock surface per unit time and area and have a significant effect on the cutting. The number of abrasive particles hitting the surface can be controlled by changing the traverse velocity. When the abrasive flow rate is too high, the focusing tube may be obstructed. Therefore, the working pump pressure and traverse velocity are the most significant operating parameters in AWJ cutting. In statistical analysis, the pump pressure, traverse velocity and abrasive flow rate were selected as operating parameters, and the hardness and density were selected as rock properties in [Eqn 5] and [Eqn 6], because of their high correlation with the cutting depth. The cutting depth of a natural stone that has not been directly studied can be calculated using the given statistical models. Figure 7 shows the cut surfaces of some of the natural stones. Figures 7a, 7b and 7c show Milas Leilac, Sivrihisar Beige and Ispir Pink, respectively (cut at a nozzle traverse velocity of 800 mm/min, a pump pressure of 360 MPa and a abrasive flow rate of 450 g/min). Although they were cut at constant operating parameters they have different AWJ cutting depths. These differences are caused by their different characteristics, especially hardness, density and abrasion resistance, which constitute their resistance to AWJ cutting. The microroughness of all the cut surfaces is almost the same (as can be seen in Figure 7), but the waviness of the surfaces differs. Microroughness of the surface is created by the abrasive grits used in AWJ, but waviness of the surface is related to the movement and drifts of the jets related to the difficulty of the AWJ cutting of a natural stone. Figures 7d, 7e and 7f show the effects of an operating parameter - nozzle traverse velocity - on the AWJ cutting depth. Akhisar Onyx was cut at a nozzle traverse velocity of 600 mm/min (Figure 7d), at 800 mm/ min (Figure 7e) and at 1500 mm/min (Figure 7f), whilst other parameters were held constant. AWJ cutting depth can therefore be controlled by nozzle traverse velocity. The parameters affecting AWJ cutting depth of some natural stones were investigated. These parameters included both rock properties and machine operating parameters. Different natural stone types have different AWJ cutting depths under the same cutting conditions because of the different resistances of the rocks to AWJ cutting. For instance, when constant operating parameters were selected, the cutting depth was only 8.6 mm for Ispir Pink granite but 177.6 mm for Ayazini Tuff. The resistance to AWJ cutting of natural stones is mainly related to the density and hardness according to the results of this study. The traverse velocity of the nozzle is the key operating parameter for controlling the cutting depth of the rocks. The traverse velocity can range from 1 mm/min to 3000 mm/min or more. No other operating parameter can have such a wide range. For instance, the pump pressure can be changed from 90 MPa to 450 MPa, and the abrasive flow rate must be between 60 g/min and 450 g/min. However, changing the pump pressure frequently can damage the pump system, and the abrasive flow rate has an upper limit because of the abrasive receiving capacity of the cutting head. This research was funded by TUBITAK (The Scientific & Technological Research Council of Turkey). I am grateful to CT Cutting Technologies and Machinery, and TOLKA Water Jet and Decoration for their valuable cooperation during fieldwork. I declare that I have no financial or personal relationships which may have inappropriately influenced me in writing this paper.